« The Man from U.N.C.L.E. Kahlil Gibran’s The Prophet is a cartoon, yes. However before you rush out to see this movie with the kids in tow, you really should read this review first. It’s not that there’s anything here that young minds shouldn’t see. On the contrary, it’s filled with inspirational life lessons that are perfectly acceptable. It’s just that it is not something a child would find particularly entertaining nor, dare I say it, most adults. Kahlil Gibran was a Lebanese-American artist, poet, and writer. Born in the Ottoman Empire on January 6, 1883, he immigrated with his family to the United States as a young man. He is best known in the English-speaking world for his 1923 book The Prophet which is an English collection of 26 prose essays. It was wildly successful and has been translated into over 40 different languages. In the Arab world, political leaders considered Gibran a literary rebel. In Lebanon, he is a literary hero to this day. 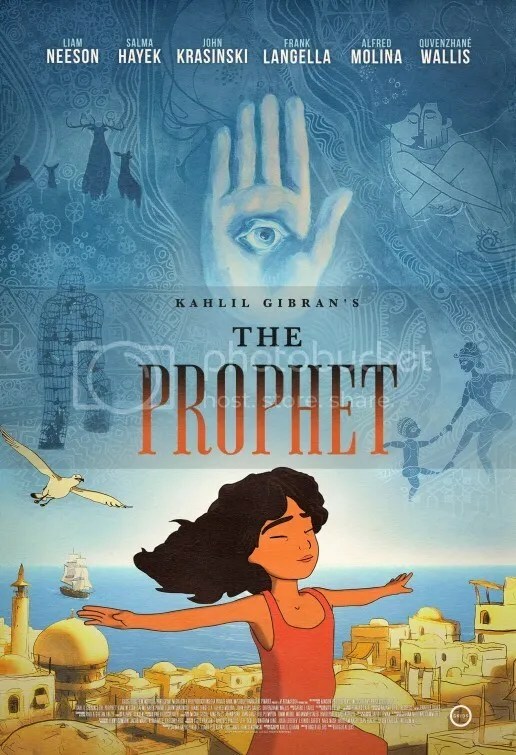 Kahlil Gibran’s The Prophet doesn’t have a strong narrative per se. Rather it’s a succession of animated poems, each one taken from his seminal work. The subjects are freedom, children, marriage, work, eating & drinking, love, good & evil, and death, with different animators for each. Segment directors include Tomm Moore (The Secret of Kells, Song of the Sea), Bill Plympton (Guard Dog, Cheatin’), Joan Gratz (Mona Lisa Descending a Staircase), Nina Paley (Sita Sings the Blues), Joann Sfar (The Rabbi’s Cat), Paul and Gaetan Brizzi (“Firebird Suite” in Fantasia 2000), Michal Socha (Simpson’s couch gag from “What To Expect When Bart’s Expecting”) and Mohammed Harib (Freej). The displays are loosely strung together by the tale of an imprisoned poet named Mustafa (Liam Neeson), who has just been released. He’s on his way to board a ship that will take him home. Along the way, he gives the advice that forms the foundation of the various segments. The obvious audience for this are devotees of Kahlil Gibran. He is the third best-selling poet of all time, behind Shakespeare and Lao Tzu, so he obviously has his admirers. If an array of animated shorts depicting his words sounds captivating, then I’d surely recommend this to you. The series of 8 videos presented here are all of noble quality – pretty images with spoken word narration. A couple have music to accompany them. My favorite was Nina Paley’s “On Children”. The shadow puppets of Indonesia inspire a mesmerizing visual tableau accompanied by a song by Damien Rice. It presents a pregnant female archer who shoots an arrow into the belly of another pregnant woman, thus giving birth to another human being. It’s utterly hypnotic. The entire movie was produced by actress Salma Hayek, who also gives voice to one of the characters, and supervised by director Roger Allers (The Lion King). The talent behind the camera is considerable and the intentions are clearly heartfelt. It’s a pleasant diversion, but far from necessary viewing. For die-hard fans of Kahlil Gibran’s poetry, however, it should prove enchanting. This entry was posted on August 20, 2015 at 9:35 am and is filed under Animation, Drama with tags 2015. You can follow any responses to this entry through the RSS 2.0 feed. You can leave a response, or trackback from your own site. I will definitely be seeing this because animation is my thing but too bad I was hoping it would be better. Although I don’t know if it will come by me so may have to wait for dvd. I don’t see it on the schedule at the Indy theater. The animation is pretty. I mentioned Nina Paley’s segment in my review. Also Tomm Moore’s contribution is gorgeous as well. They are such amazing animators. Excited to see what Bill Plympton can do because he is always so creative. I loved his movie this year called Cheatin’. Definitely not for everyone but worth a watch if you appreciate Indy-animation. His style is unmistakable. He animates the chapter on “eating and drinking”. In his portrait, the sweat of a plowman turns into a vase of drinking water which evolves into fruit then wine and eventually trees. Who knows when this film will ever reach Salt Lake but in the meantime here is my blogging friend Mark’s review of The Prophet. It sounds like certain sections work better than others but worth a watch. I look forward to seeing it eventually. This looks really good. I remember reading the classic in college. I appreciate your review, Mark. I think it will appeal most to devoted fans of the author. Enjoy! GKIDS is a distributor animated films like A Cat in Paris, Chico & Rita, The Secret of Kells, and Song of the Sea. All got Oscar nominations for Best Animated Feature . I doubt this would too, but you never know. Sorry. I slept through a lot of this. What I did see was just ok. If you love poetry, you’d probably like this. It has sedative properties. Very calming. Finally saw it. The framing device is pretty lame but the shorts were good. Should have just kept it a short showcase like a Fantasia instead of trying to put the plot around it. 100% agree. The shorts were fine (a couple were great), but the “story” was just awful. Yeah it reminded me of the animated shorts we used to watch in Sunday School. I was kind of surprised how bad that part was. Sounds like it’s well-done, but not quite my cup of tea. I’ll probably skip it since I’m not really familiar with Kahlil Gibran and poetry has never been my strong suit.